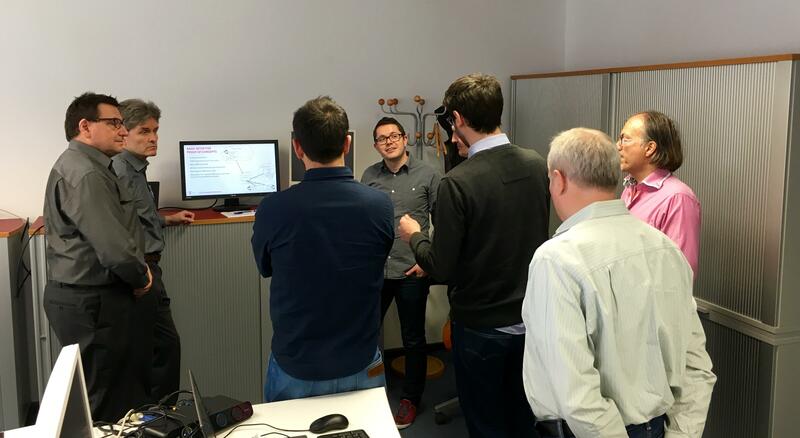 Around 20 experts from both academia and industry joined the 11th expert workshop on “Network Slicing and Next Generation Service Programming Approaches for SDNs in 5G" at Deutsche Telekom Laboratories in Berlin on April 22, 2016 to discuss recent concepts and prototyping results in this context. Nine speakers presented their work in three sessions and two demonstrations have been performed during the lunch break. 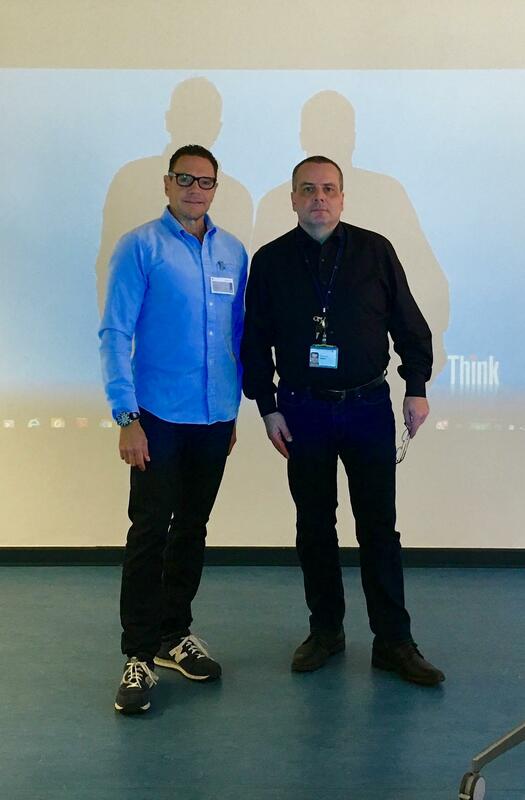 After the workshop opening by Prof. Thomas Magedanz, Hans Einsiedler welcomed the experts from Germany, Switzerland, Poland and Sweden at T-Labs. 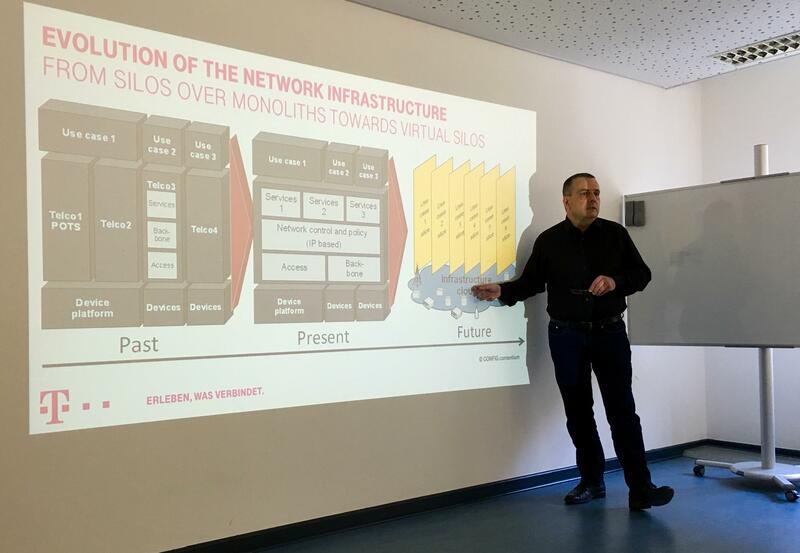 In the first session H. Einsiedler from T-Labs presented in the first talk the 5G!Haus activities of Deutsche Telekom AG and in a subsequent talk recent concepts for 5G network slicing and service composition. 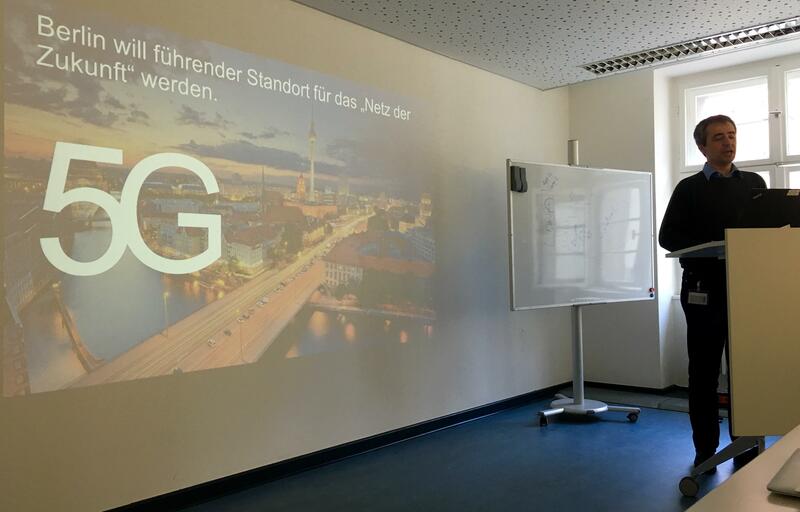 After that, C. Pampu from the Berlin Senate of Economy and Research presented the targets and regulatory frameworks for the upcoming Berlin 5G Testfield. 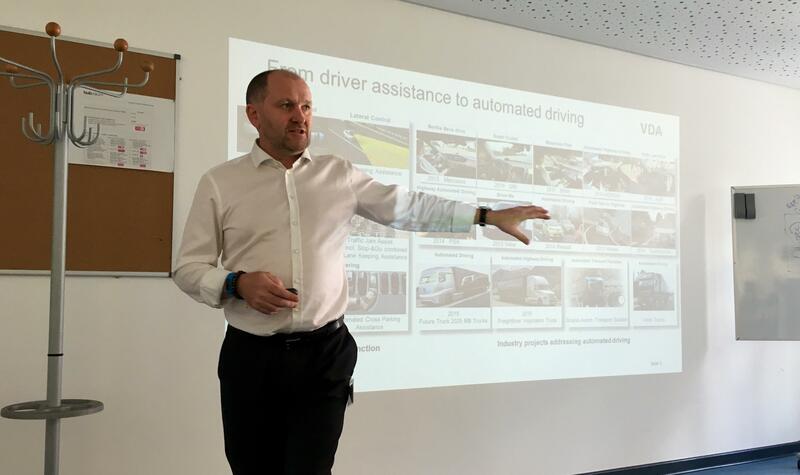 Within the second session G. Smethurst from VDA talked about the requirements for networked and autonomic driving. This talk was followed by a presentation on 5G network slicing by W. Hahn from Nokia. During the lunch break two demonstrations have been shown. T-Labs has shown a demo on service roaming enabled by network slicing, whereas G. Carrella from TU Berlin has shown the Open Baton Toolkit enabling virtual network slice deployments on top of cloud infrastructures. In the afternoon session devoted to academia different universities presented their recent work activities. 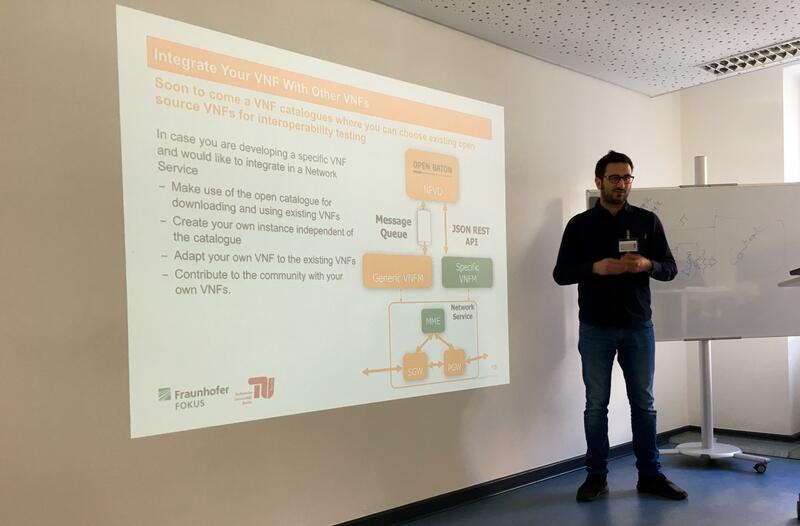 G. Carella from TU Berlin provided in the first talk more details on the Open Baton toolkit, which is used in various research projects on NFV and SDN and within the FOKUS 5G Playground. Right after V. Cima presented the Apache Cloudstack for NFV and related toolkit developments at ZHAW in Switzerland. Peter Feil from T-Labs presented the EU project SoftFIRE, which will provide a distributed SDN Testbed in Europe which will launch open calls in the second half of this year. The final talk on NFV service chain optimizations was presented by A. Kassler from Karlstad University in Sweden. The highly interactive workshop was closed at 17.00 by the organisers. This web page informs you about all activities around the technical discussion group “NG Service Delivery Platforms & Service Overlay Networks" which is one of the expert talks of the professional group “Kommunikation und Verteilte Systeme (KuVS Fachgespräche)". The content will be constantly updated with a meeting log covering the timetable, agendas, logistics, slides, participant lists, minutes and photos. 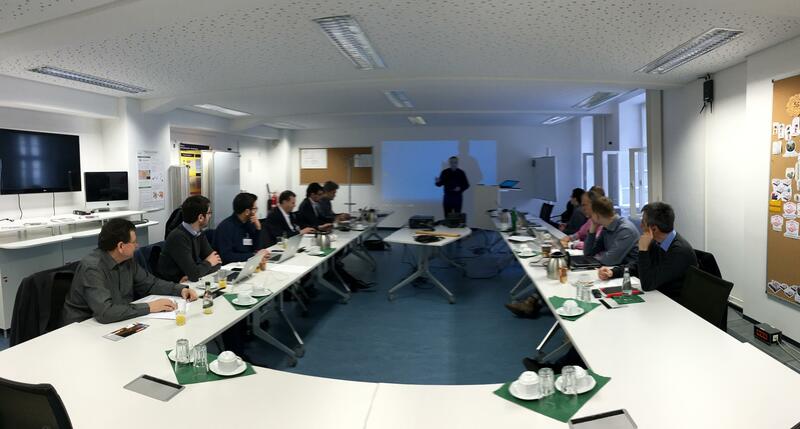 Although this technical discussion group is part of the Fachgruppe KuVS (Kommunikation und Verteilte Systeme), which is a joint committee of Gesellschaft für Informatik e.V. (GI) - German computer science society - and Informationstechnische Gesellschaft (ITG) im VDE - German Information Technology Society - and some communication or meetings will be performed in German, this page is intentionally written in English, as most of the documents, papers and slides will be only available in English. NFV and SDN leverage the benefits of virtualization and cloud computing for networking. The technologies are rapidly maturing and first early deployments are already underway. Their deployment will fundamentally transform networking infrastructures. Using network equipment consolidated to industry-standard servers, switches and storage will turn networks into agile programmable service platforms. 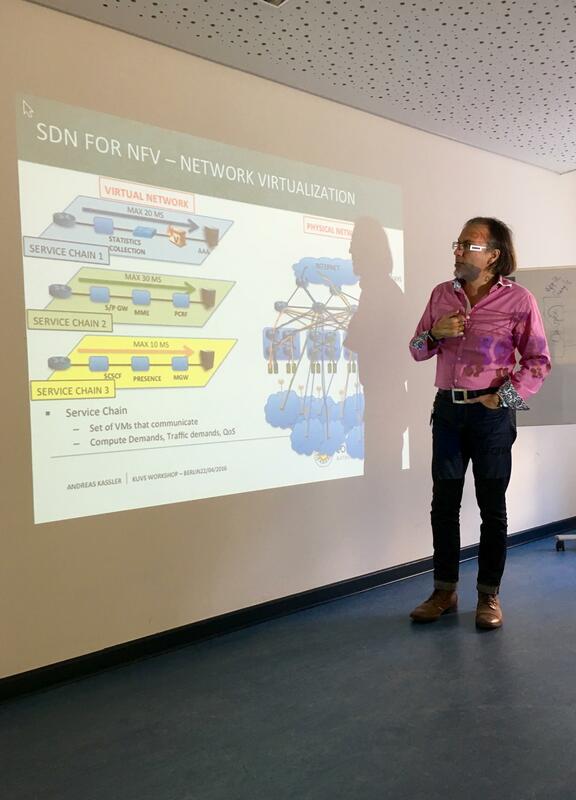 NFV and SDN bring important features such as network slicing and multi-tenant isolation, elastic scalability and dynamic change of network topologies to adapt to changes in traffic levels and service demands. Upcoming network services require a new network management approach. The network management model has to move away from being low level device-oriented toward higher abstraction layers. At its core lies orchestration as enabler for dynamic network provisioning and service chaining. NFV forwarding graphs describe an abstract end-to-end service definition and specify attributes regarding like performance, capacity, resiliency. The orchestrator keeps a complete view of the infrastructure, allocates the resources for the services based on their requirements and validates network services at the expected parameters during the life cycle management and integration between legacy and virtual resources. 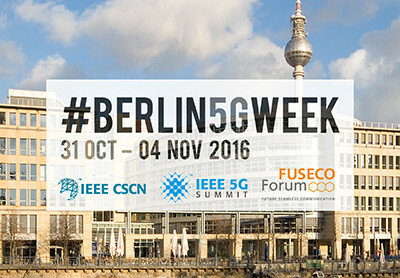 This shift accelerates further network convergence and also provides a framework for the transition to 5G networks. Networks will have to accommodate heterogeneous groups of users with highly divergent requirements. Use cases range over diverse areas as manufacturing, medicine, critical infrastructures or tactile Internet integrating Machine-to-Machine (M2M) and Internet of Things (IoT) services. Resources need to be allocated to meet the specific demands of each use case. SDN, NFV and network orchestration provide here the means to implement logical Network Slices which enable operators to provide networks on an as-a-service basis and meet the wide range of use case requirements. Emerging service platforms will have significant impact on the mobile industry but also transform the industry sectors in vertical markets enabling an unprecedented level of innovation creating new economical ecosystems. This discussion group aims to establish an active scientific SDP community in Germany addressing the involved research challenges. See the Event Minutes here!